Rendering of entrance with interesting detailing on poles. Credit: SHAPE Architecture Inc. 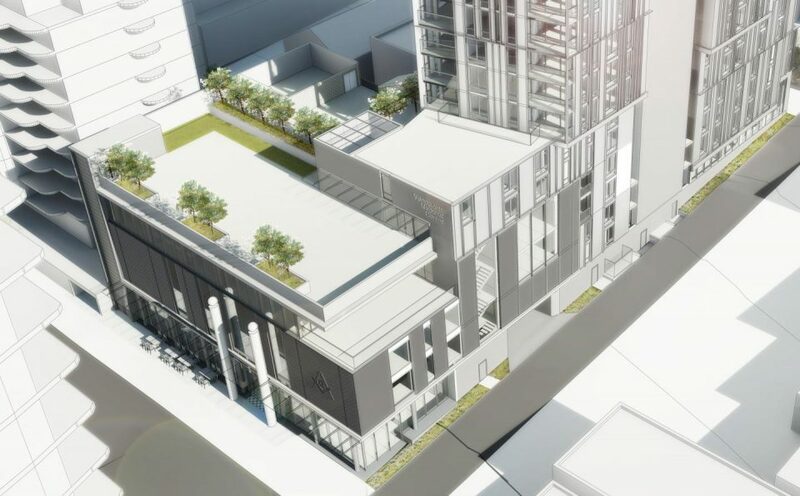 The redevelopment of the Vancouver Masonic Centre on West 8th between Granville and Hemlock is about to get underway. 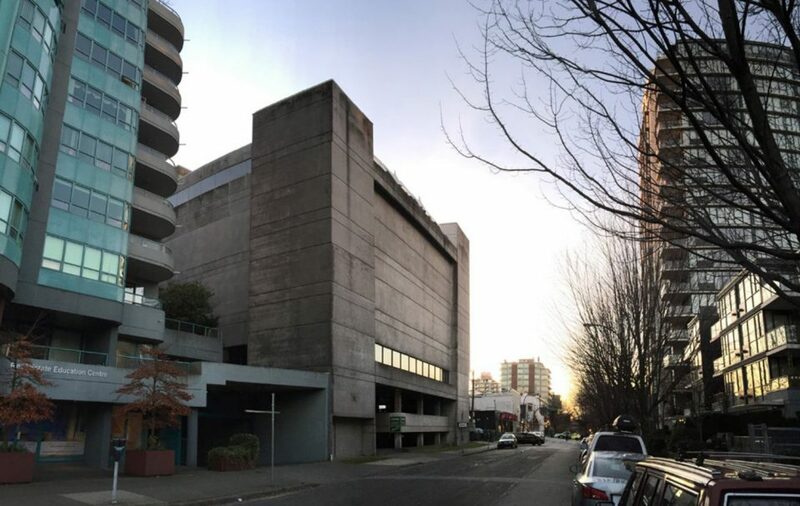 The current four-storey structure, built in 1974, is a nearly windowless concrete bunker containing offices and a popular banquet hall. 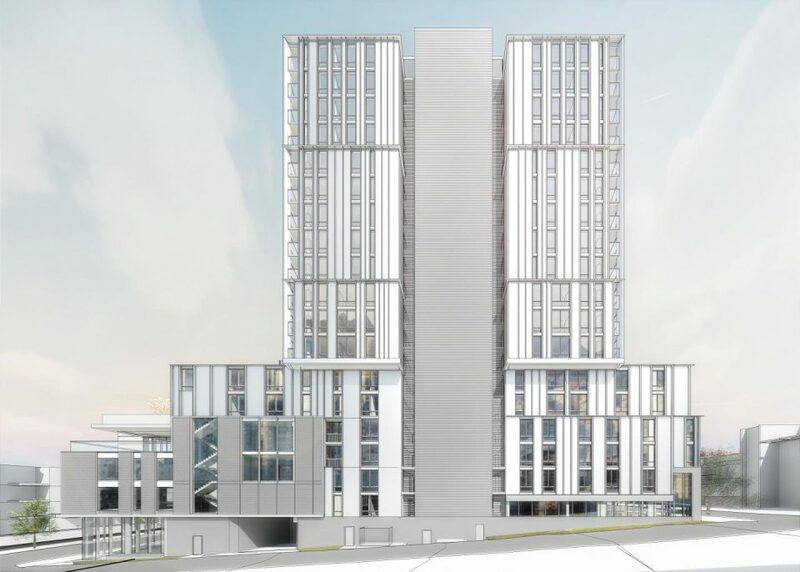 The redevelopment will add 159 rental apartments to the site in an 18-storey tower, as well as a new four-storey building for the Masonic Centre. Rendering of new Vancouver Masonic Centre, view west. Credit: SHAPE Architecture Inc. 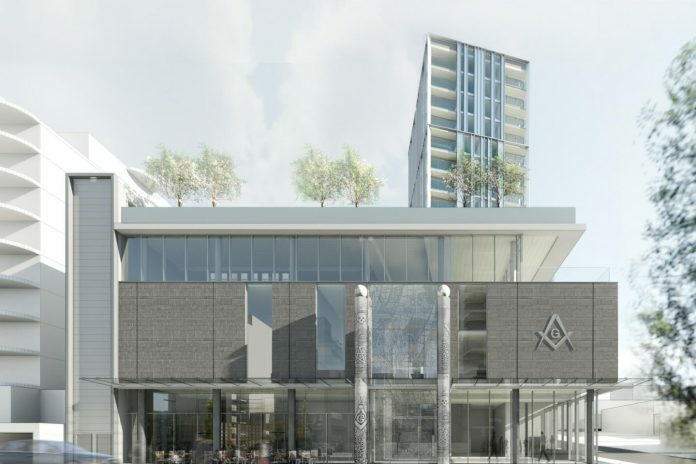 Rendering of new Vancouver Masonic Centre, view southeast. Credit: SHAPE Architecture Inc. Rendering of new Vancouver Masonic Centre, view northwest. Credit: SHAPE Architecture Inc. Building form from Granville Street bridge. Credit: SHAPE Architecture Inc. The apartments will be a mix of market and below-market rents, with 51% of the units below market, and 30% of the units below BC Housing’s Housing Income Limit. 65 of the units will be studios, as well as 51 one-bedroom units and 43 two-bedroom units. 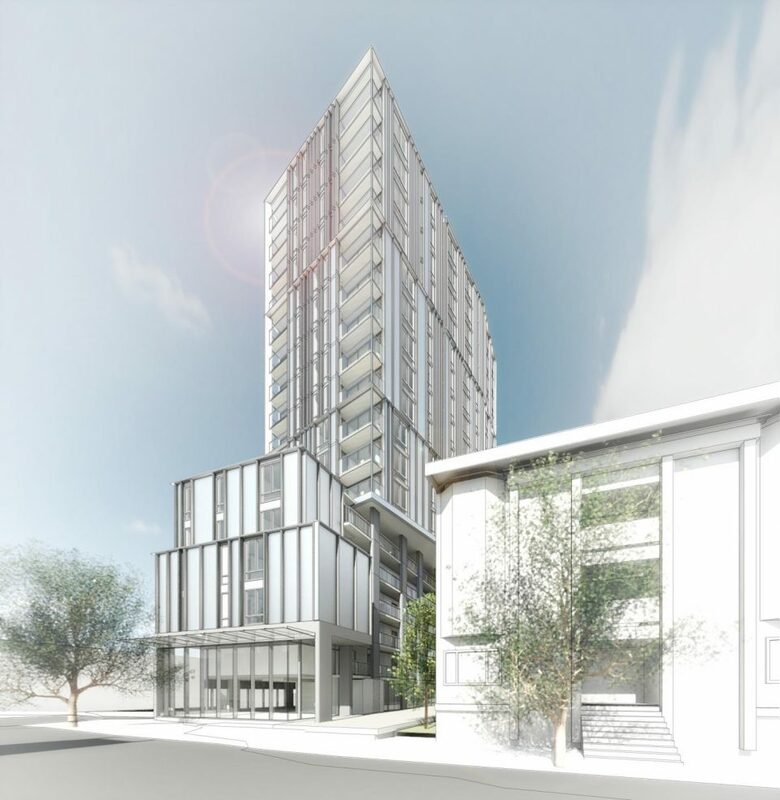 A neighbourhood restaurant is proposed for the West 7th Avenue frontage, as well as a pedestrian mews through the site. The architecture firm is SHAPE Architecture Inc. and the development is targeting LEED Gold. Rendering of new Vancouver Masonic Centre at dusk. Credit: SHAPE Architecture Inc. Current Vancouver Masonic Centre. Credit: SHAPE Architecture Inc.